Expectation. This feeling has been with us since we first acquired the concrete egg-shaped tank now sitting in our cellar. 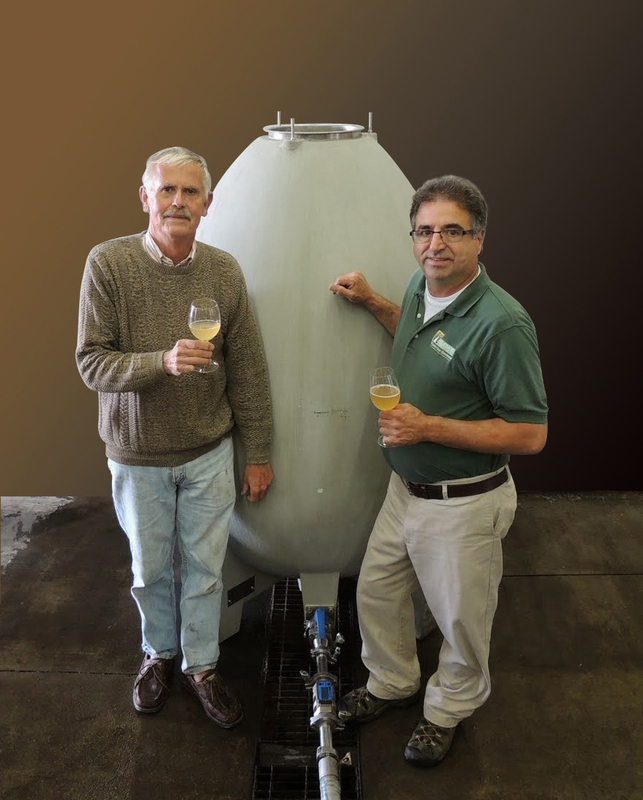 When Gene Pierce, our co-owner, came across concrete eggs on a trip to the Rhone Valley, the intrigue was instant and thoughts began to race surrounding the unique opportunity for a tank like this at our winery in the Finger Lakes. Concrete as a medium for fermentation has steadily gained popularity and continues to do so as it has virtues and benefits of both oak and stainless steel sans drawbacks. Whether desirable or not, oak will give a bit of itself to the wine, and stainless steel has potential to remain flat without the ability to breathe and evolve the way an oaked wine can, but concrete combats these deficiencies. Concrete tanks have been used successfully in winemaking for centuries, yet it wasn’t until the early 2000’s that the idea of an egg-shaped concrete tank arose. The shape was designed by Michel Chapoutier, a winemaker from the Rhone Valley of France. He commissioned Marc Nomblot, a French concrete vat manufacturer, to construct the first egg vat in 2001. 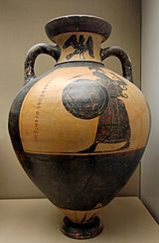 The egg shape, similar to the clay amphora wine jugs from the Roman Empire, eliminates dead corners and ensures a continuous flow of fermenting wine by creating a natural stirring effect. A benefit to using the egg is that the amount of oxygen exchange is miniscule, allowing for extended yeast contact without the danger of reduced, naturally occurring sulfur aromas. The size and insulating properties of the concrete design eliminates the need for artificial temperature control during fermentation. Because concrete is porous, the tanks are said to be “breathable,” like barrels, and will allow similar richness and body in the wine, without imparting any oak character. Since the concrete in the egg is a more neutral substance, the wine will have purer fruit flavor, similar to what you would find using stainless steel. The egg in use here at Glenora was built and imported from Burgundy, France. It weighs 2,645 pounds empty and a whopping 4,712 when filled. It can hold 184 gallons or about 77 cases. Steve DiFrancesco, our winemaker, chose to christen the tank with Pinot Blanc, grown by Scott Welliver, co-owner. The wine will remain in contact with the yeast lees – deposits of dead yeast – until February. The lees add richness and full body to the wine. Are the cement eggs any more labor intensive than either stainless or oak? In other words, are they a bear to clean? @thedrunkencyclist We were able to catch up with Steve, our winemaker, and he gave us more details regarding the egg. We haven’t yet cleaned it as it is filled, but it will be cleaned with water and treated with tartaric acid. It cannot be cleaned with water higher than 108 degrees or it could cause thermal shock and shatter. The cement eggs are more labor intensive than stainless steel. Since it creates the natural stirring, Is fermentation in the concrete egg the same as or faster than oak? @RubyBird So far, fermentation is moving faster in the egg than both stainless and oak because the concrete is thicker and more insulated causing the temperature to remain stable. How did that egg-shaped concrete tank work out? There is an article about them in this months Wine Spectator on page 20. Sounds like a good idea but I think it would take time to figure out how to use them to get the results your were looking for. @wpawinepirate The project is still in progress, but we anticipate an early July release of the three Pinot Blancs. During fermentation, the wines began to take on personalities of their own. The micro-oxygenation that occurred using the egg and barrels helped to open up and develop flavors from both the fruit as well as the yeast interaction during fermentation. However, the concrete egg contributed no additional flavors to the wine the way the oak barrels did. The stainless steel is very inert, contributing little to the wine. However, dead corners in the stainless tank slowed down aging and development of the fruit derived flavors. Any other questions, let us know!